The key to a happy marriage: indoor plumbing. We don't want to have a black tank in the Airstream. A composting toilet is going to be a little different in terms of maintenance, but we think it's ultimately going to make waste disposal easier and more sanitary, and it's going to keep the bathroom smelling better than if we're hauling around a tank of raw sewage. The two big contenders for our choice were the Airhead and the Nature's Head. Both have similar designs, liquid diversion, and built in exhaust fans. We ultimately chose the Airhead because it had a household style toilet seat, and a smaller transparent area in the liquids tank. The Nature's Head has a toilet seat that's molded into the base, so you can't lift it. It also has a completely transparent liquids tank, so the contents are entirely on display. Now that we've been using the Airhead for a while, I'm wondering if the Nature's Head wouldn't have been a better choice. Given how unpleasant an overflow of the liquids tank is (don't ask), it's probably an advantage to see the level before it reaches the small difficult-to-tell-if-it's-yellow-or-not window. The Nature's Head also has secondary containment for the liquids tank which, while I'm sure it isn't pleasant to clean in the event of an overflow, is better than the alternative. The ability to lift the toilet seat is less useful than you might think because of the amount of splash-back a standing pee will send your way, regardless of whether you aim at the recommended spot. And the way the hose attaches to the toilet base involves gluing a scrap of pipe around a socket fitting. For over $1,000 in plastic, you'd think we could afford a proper &$@# bulkhead fitting. Does it work? Aside from the above nuisances, it works great. Does it smell? The bathroom doesn't smell at all. The solids tank doesn't smell at all. However, the liquids tank does get rather ripe, which you will definitely notice while you're dumping it, but not when it's just sitting in your bathroom. 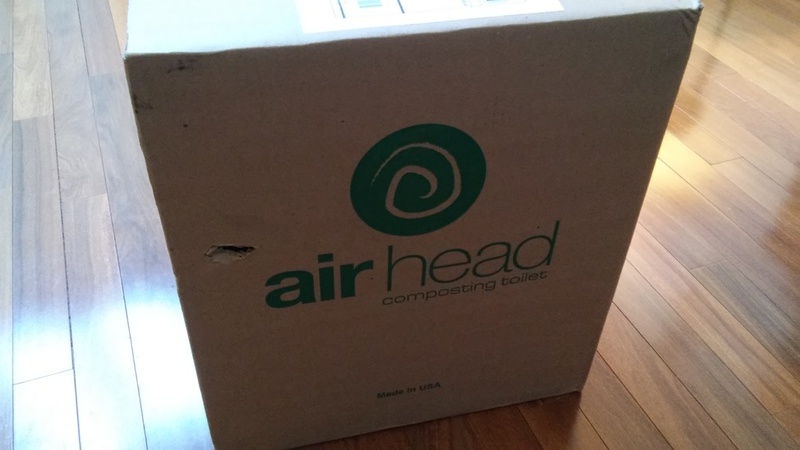 See this post for the unboxing of our Airhead. If you're looking to buy a Nature's Head, check out The Wynn's page for a coupon code. I'm not aware of any coupons available for the Airhead. I reused the old gray tank to receive all the gray waste from the trailer, and then added two 16 gallon tanks from Vintage Trailer Supply for additional gray water storage. There are larger gray tanks from VTS, but those would take up the entire space inside the frame members, which would make supporting them slightly more difficult, and wouldn't leave any extra room for insulation. I could have reused the fresh water tank, but given how gross everything was when we bought the Airstream, and the fact that I accidentally melted a few holes in the top of it when I was removing the floor, we got a brand new fresh tank from VTS. If you intend to use a SeeLevel tank monitor with these tanks (or any in-frame tanks on an Airstream from this era), you're going to need the shorter junior sender boards. I bought mine from bestconverter.com and they allowed me to do an even exchange of my standard senders for the junior senders. I'd suggest you call them before you place the order so that you can get the right stuff the first time. I chose to rebuild all the drain and vent pipe with ABS, which is lighter and more flexible than PVC, and it's what was there originally. It's a little tough to locate in my area—something to do with arbitrary local plumbing codes prohibiting its use—but I was able to get my hands on some while I was out of town. There was one fitting that was particularly tricky. The factory gray tank, which I'm reusing, has two ABS fittings inserted into it and secured with hose clamps. One is a 1-1/2" street 45, which is easy enough to find. The other one is a 1-1/2" hub x 1-1/2" hub x 2" spigot sanitary street tee. I nearly gave up and used a 1-1/2 sanitary tee with a 1-1/2x2" bushing, but that would have lifted the shower drain an inch, which would force me to raise the floor of my shower accordingly. I couldn't find this thing through any plumbing supply houses, but wouldn't you know it, you can order one online from the orange box. I replaced all the fresh water plumbing with PEX. More flexible than the original copper, and far less likely to suffer damage from freezing or corrosive water. For what it's worth, I used the stainless clamps, not the copper rings. Some googling would lead me to believe that the stainless clamps are less susceptible to freeze damage than the copper ones, but all the comments to that effect seem to refer to the same offhand comment in a forum. Not exactly hard evidence. I like the stainless crimps because they're easy, that's it. I'm using the brass elbows and tees because the plastic ones feel flimsy to me. Downside to PEX is that it's susceptible to rodent damage. Since all my plumbing is going to be inside the living space, not inside a wall or belly-pan where a rodent might be more inclined to nest, I'm not too worried about rodent damage. The one material I would urge you NOT to use in a trailer is CPVC. I know, it looks plenty flexible when it's new. But take it from a guy who has flooded a doctor's office in the middle of the day—it gets brittle as it ages. I installed an outdoor shower in the old battery compartment. It's useful for dog baths, spraying sand off our feet, and general outdoor washing. When we're camping with friends, it's nice to unlock the outdoor shower to give them access to hot and cold running water. The outdoor shower also serves as our low point drain for the curb side. I didn't like any of the outdoor shower packages available, so I just installed a hot and cold frost-proof hydrant with a handheld shower head. The one I used is whatever was on sale at the hardware store, but the most popular RV shower head is the Oxygenics low flow model. In both the indoor and outdoor showers, I added a shutoff valve to the handle that actually shuts off the water, and a more flexible hose. We didn't need a check valve leaving the water heater to prevent cold water cross-feeding into the hot side, but if you have a tank style water heater, you might want to add one. I'm not a huge fan of the fact that this fitting is plastic, but it's the nicest one I could find that's recessed into the wall, it's very popular OEM equipment. It installs in a way that will be relatively easy to replace when it fails. I used plastic coated copper tubing for the propane lines. The plastic coating is not required, but it's a nice extra bit of protection. Beware, not all copper tubing is suitable for propane -- make sure the stuff you get is appropriate. 50' of 1/2" (trunk) and 50' of 3/8" (branches) were the right quantities to buy for my project. I had some left over, but 25' of either would not have been enough. I used a cheap flaring tool from Lowes to make my flare fittings, and it worked fine. Get some 3-in-1 oil and oil the threads on the flare tool before you use it so the wingnuts don't seize up. You'll also want to use the oil on the flare nut threads so you can get them tight enough. I used the side of a hole saw as a guide for bending the 1/2" tubing. It doesn't matter what you use, just don't try to make tight bends freehand or you'll kink the tube. Find something round with a sufficient diameter to bend it against. If you bought 50' of each, you'll have some extra tube to practice with. I bought a tubing bender for the 3/8" tube for tighter angles. It worked OK, but it did some damage to the plastic coating wherever I used it. The tubing bender would work better if you used bare copper, or if you used one designed for larger diameter tube. The regulator I got from VTS is tiny. TINY! It doesn't really fit on the mounting bracket it's so small, so I'd suggest looking at the ones available elsewhere if that's important to you.